SEPTEMBER 27, 2012 — EVANSTON, ILL. — The third annual ‘Paint Evanston Purple’ pep rally will begin tonight at 6 p.m. at the iconic Northwestern University Clock Tower at Clark St. and Orrington St. in downtown Evanston. The Northwestern University "Wildcat" Marching Band will be performing as part of the celebration. The Evanston Township High School Band, directed by Northwestern alumnus Dr. Dave Fodor (GMu98), will also appear, along with Evanston Mayor Elizabeth Tisdahl, Wildcats head football coach Pat Fitzgerald, and 2012 Northwestern team captains Brian Arnfelt, Kain Colter, Brian Mulroe and David Nwabuisi. September 26, 2012 — EVANSTON, ILL. — The Northwestern University "Wildcat" Marching Band will be on hand this afternoon as the Wildcat Men's Soccer Team hits the pitch against DePaul University. 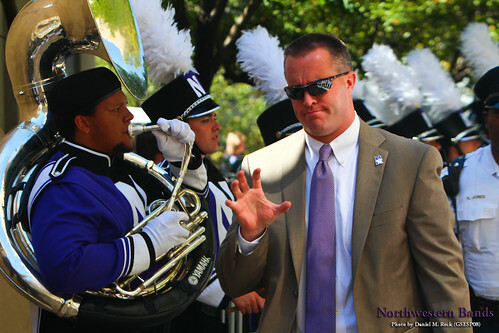 "Northwestern freshmen will learn the NU fight song during halftime of the match," reports NUSports.com. "Members of the NU men's and women's basketball teams will teach the fight song." It's a rare mid-week match, but is expected to be well attended at 6 p.m. at Lakeside Field on the Evanston campus. The game is being played as part of Northwestern's Wildcat Welcome, a week-long orientation experience for the thousands of new students who arrived last week. 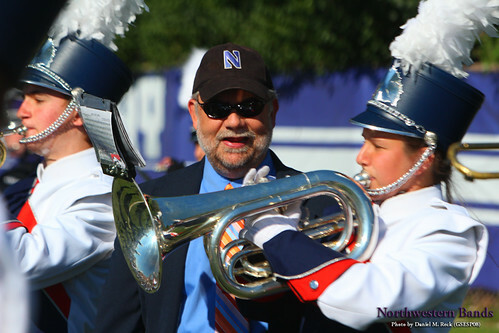 SEPTEMBER 12, 2012 — EVANSTON, ILL. — "My first memory in high school band in 1968 is when we all loaded into busses to come to Northwestern's High School Band Day," says Dr. Dave Fodor (GMu98). 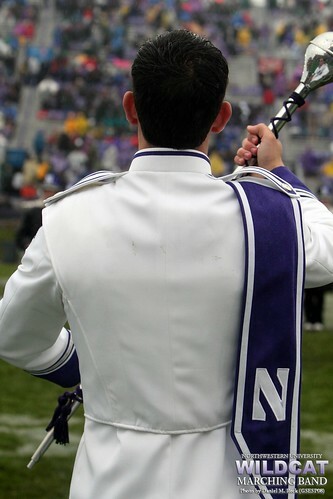 "It was Northwestern versus Wisconsin, and Mr. Paynter was the NU band director." Fodor, who has directed the Evanston Township High School band program for 22 years, brought 102 of his marching band students to last Saturday's High School Band Day at Ryan Field, hosted by the Northwestern Univesrity "Wildcat" Marching Band. "I understand the importance of the role the band plays," he says of why his band participates in the annual event, which saw over 1,000 high school students crowding between the end zones at half time. "We mirror each other. We share time together. We share the town," he says. "My students get to see the collegiate experience." Fodor knows a little something about the collegiate experience, too. While he studied music education at the now-Bienen School of Music to earn his Ph.D., Fodor was the drumline instructor for the Wildcat Marching Band. SEPTEMBER 2, 2012 — EVANSTON, ILL. — Shlepping instrument cases and all of the clothes, books, and other necessities of college life, nearly 200 students are arriving at Regenstein Hall on the Evanston campus for the first day of pre-season camp for the Northwestern University "Wildcat" Marching Band. Veteran drum major Michael San Gabino (Mu13) is among the "returners" who are greeting them and helping distribute their purple and black uniforms and rehearsal schedules. "Every season is different," he says. One of those differences is Will Ritter (WCAS14), the junior psychology major who is joining San Gabino with his own white and silver drum major's uniform. "I'm looking forward to building great relationships with all of the people involved in NUMB," says Ritter, "as well as being in a position that has a big impact on such an amazing organization." Three years ago, Ritter was like many members of the Wildcat Band, brimming with passion for the band and the university. However, he was also looking for ways to contribute more. "At the beginning of sophomore year, it clicked for me that drum major was the perfect outlet," Ritter says, "So I decided to go for it." Both Ritter and San Gabino, along with other candidates, interviewed and auditioned for the office. The auditions included conducting the band during the preparations for the Meineke Car Care Bowl of Texas. For Ritter, "The most challenging part of the process was the fact that I had no experience as a drum major in high school," he says. "I had no idea how to use a mace and had no formal conducting training." AUGUST 19, 2012 — EVANSTON, ILL. — Daniel J. Farris' goal "is to balance the signature moves and traditions that have been a part of the [Northwestern University] Wildcat Marching Band field shows since the group's inception way back in 1926 with the innovations in the marching arts and entertainment," reports Eliahu Sussman in the August issue of School Band and Orchestra magazine. 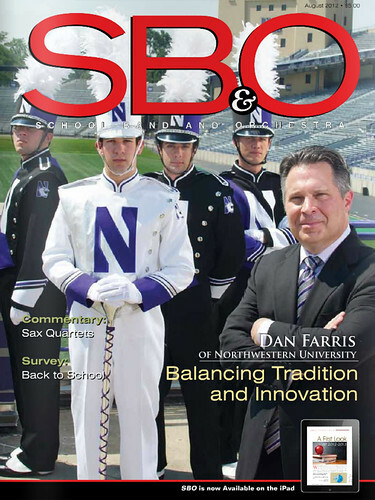 As tweeted last month, the trade magazine visited the Evanston campus to photograph Farris, drum major Michael San Gambino (Mu13), and other members of the Wildcat Band for the cover story, which spans 11 pages. "We've set in place a proven system and a hierarchy of student leadership," says Farris in the article, describing his "secret for making it all work" in the 13 years he has directed the athletic bands. "A special part of being at Northwestern is being surrounded by such talented and bright students," he says. It's a sentiment shared by Dr. Mallory Thompson, the university's director of bands. "I'm all in favor of the students putting their stamp on the organization and watching evolve," she says. Thompson is herself an alumna of the ensemble, and just the fourth director of bands at Northwestern.